In addition to policy, financial and technical aspects, MED-DESIRE project includes awareness raising campaigns for a compressive approach to develop the market for renewable energy and energy efficiency. 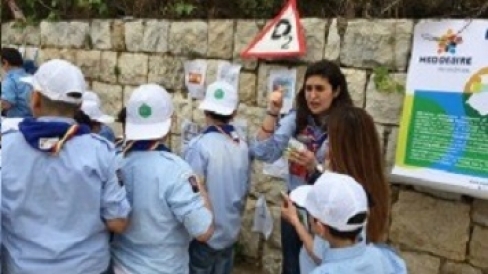 As such, throughout the month of May 2015, the LCEC team within the MED-DESIRE project carried out many awareness-raising activities in different age groups, benefitting from the scout experience in delivering messages in an educational and interactive way. The activities began on May 3rd, 2015 at the Champville College in Beirut, Lebanon. The event was organized by the Boy Cub Scouts and this year, following the request of the MED-DESIRE team at LCEC, the theme of the event was Renewable Energy and Energy Efficiency. Over 3,000 contestants participated in this energetic day, full of activities concerning energy conservation. The event was structured to be educational and interactive at the same time. It included different type of activities focusing on renewable energy and energy efficiency. The event was consisted of one main activity in addition to other smaller games. The main activity aimed to introduce energy concepts in a fun way; it included several missions with scout games, workshops and exhibitions. The game started at 11:00 am and continued throughout the day. The event also included two main animated characters symbolizing energy that were present and cheering during all stages of the event; one was a light bulb and the other, the sun. These characters had challenges and questions on energy as they walked through the different stages of the event. The questions were designed to educate the scouts on the source, origin, conservation and use of energy with useful and necessary information. Each correct answer was worth a ball, exemplifying an electron... More electrons, more energy! The big game was divided into 5 different sets of mini games offering challenges on solar panel systems, wind turbines, hydropower and energy conservation. The objective behind these activities was to educate and teach the young generation about their role, contribution and responsibility in saving energy and in discovering new means to develop renewable energy. The first game was about solar panels. It explained the solar panel operation system, transforming the energy received from sunlight into useful electricity. The goal was to learn the pattern of a solar system that shows the different steps as it was indicated in the actual mockup. The second game showed the sources of energy loss at home. A story of an ordinary day at home was told, this story included different hidden instances of energy waste. The group who detected errors or sources of leakage and energy loss had to run to the table and turn off the switch for the device in question. The third game showed the operation of the windmill and the principle of wind power. Scouts had to fit the pieces of windmills (Sticks + propellers), and use them in progressing across a pool of water. The fourth game demonstrated the operation of the water mill. Scouts had to divert running water in order to fill a bottle. Once the bottle is filled, the group could run water from the bottle into a funnel at the top of a mill. The group that managed to rotate the shaft attached to the outlet of the mill (using water that will turn the propellers of the mill) won the challenge. The last game showed how big surfaces captured the energy more easily than small areas. Each group of six had two sheets (large and small symbolizing solar fields) and a ball (symbolizing the sun). Players had to keep the ball above the sheet. If a group throws the ball to another group the other group had to catch the ball on the sheet. Each group had to use the small cloth first and then the big one in catching the balls. The group who managed to catch more balls in both sheets won the entire game. The event also comprised a concert for the scouts, distribution of the tokens. The Closing ceremony of the Rally was at 16:30.